You will feel welcome at this newly renovated, 100% smoke free and 100% LED (green) Houston area hotel. A friendly staff is ready to welcome visitors in northeast Houston. 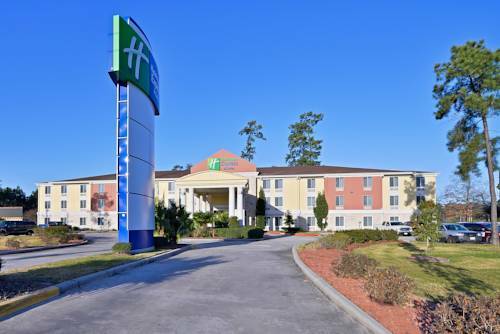 The hotel's location is just off US 59 and seven miles north of George Bush Intercontinental Airport (IAH) in the beautiful community of Kingwood. Kingwood Medical Center and Memorial Hermann Surgical Hospital are right next door. Insperity and Weatherford are less than one mile away, and Kingwood's finest golf courses and tennis courts are within two miles. With free high-speed wireless Internet access, you'll make the most of your stay in Kingwood. The area around the hotel's property is known for its natural beauty. Heavily wooded acreage is home to deer, fish and birds. We live in harmony with nature while bringing to you a thriving commercial center. It's just four miles to Town Center where you can stroll through the park and visit local shops and restaurants. Are you ready to shop? Deerbrook Mall is only two miles away with all your favorites like Dillard's and Macy's. Enjoy your stay in Kingwood, Texas with our hotel's special treatment, like the free, hot Express Start Breakfast Bar served every morning. We look forward to welcoming you. Open 24 hours. Serves breakfast, lunch and dinner. Location is within walking distance with shared parking lot. All guests receive a 10 percent discount. Restaurant also provides delivery service to the hotel room. Great Steaks and Seafood. Casual atmosphere. Features many of your favorite stores from Macy's to Dillards and a food court with many selections. Featuring Dillard s, Macy s, JCPenney, Sears, Palais Royal, Barnes & Noble Booksellers, AMC 24 Screen Theatre and 140 other great stores and eateries, Deerbrook Mall offers terrific shopping, dining and entertainment for the whole family. With its stunning architecture, exceptional store mix and distinctive style of entertainment, The Galleria has established itself as the #1 shopping and tourist destination in Houston with over 24 million annual visitors. Seaside community with beautiful beaches, shops and restaurants for the whole family to enjoy. Multi-use business park housing some of Houstons biggest corporations. Also home to Greenspoint Mall and many national brand resturants and clubs. Located in the downtown area and home to the NBA Houston Rockets. Venue is also host to many big name concerts and shows. - George R Brown Convention Ctr. Convention Center located downtown and very close to Discovery Green, Houstons newest park.